The Sennheiser CX 5.00G is an upgrade to Sennheiser’s original CX500 range. 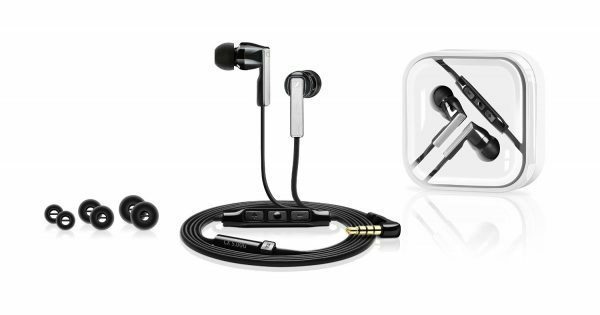 This time, it comes with in-ear headphones that offer control of calls/music, as well as volume control. Two models are available, the CX 5.00i, which works on iPhones, and in a rare turn of events, the CX 5.00G, which has been focused on the Android users among us, and the G specifically stands for (Samsung) Galaxy. These are noise-blocking ear canal phones by definition, making them good in-ear headphones that provide some noise isolation as well. A premium design comes as no surprise as these are from Sennheiser. Brushed metal finish features on both the ear-phones, while the cable itself is slightly eliptical and flat. This is a new twist on the tangle free cable. The controls are available as buttons just down the wire, and the buttons have a good tactile feel. All in all, it looks good, and feels good. To me, in-ear phones are not my go to choice. While easier to carry, they often mean I end up with tired ears. I either have over sensitive ears, or feature an ear size that is somewhere between small and medium. Either way, to me, comfort on these means a lot. The Sennheiser’s do not disappoint. I have used them on hour to two hour long commutes, and while you won’t say that you can’t feel them, they are fairly comfortable for long journeys. They are rather light, so don’t worry about them putting any weight on you. The noise isolation is affective the moment you put these in your ears. There is no active noise cancelling, so the headphones rely on blocking out noise based on physical isolation. These perform well in that regard. A lot of reviews mentioned that changing ear-bud sizes changed performance for them, and the voice went from good to bad to good, depending on what they tried. I made some changes, but I found the medium ones worked best for me. Moving on, the sound. They provide a good well balanced sound. It is on the flatter side, with a deeper bass than treble. I find most in-ear headphones, and in fact most headphones these days tend to focus on that, and these deliver the same. Overall though, they work well for most genres of music, whether your poison be rock, or pop, or classic. This is probably where these shine brighter than many others. Most good earphones provide control for Apple products, but you hardly get any that provide control beyond taking calls. Not many will let you adjust volume or skip tracks. These are an exception, and they work well with most Androids. While I have not tried it myself, a review even mentioned that they work with Blackberry! I have tried these on my Galaxy S4, the LG G3, and recently the HTC ONE M8. It delivers on all fronts, and works well. They come in both black and white, and you can also buy the iPhone variant, the Cx5.00i. They retail for about £69, and can be bought directly from their website, or other retailers such as Amazon.